Most men like straight talk. Just tell me what you want me to do and/or not to do. I do not want a lot of details but enough that I understand what needs to be done. God obviously knows this and so for you fathers reading this who are like me, God gives it to us short and sweet. 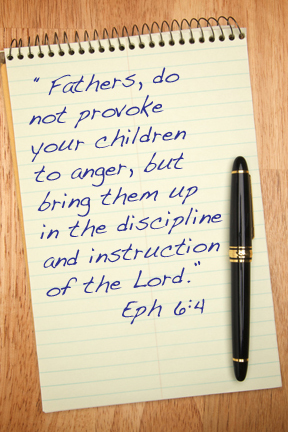 “Fathers, do not provoke your children to anger, but bring them up in the discipline and instruction of the Lord.” (Ephesians 6:4) That’s it! The only direct command given to fathers in the New Testament. A negative followed by a positive. Don’t do this and do that! Simple, concise, yet so much to unpack. Between now and Father’s Day, I will try to unravel this verse and hopefully encourage fathers who read it to be examples of gospel grace in the lives of their children. Tune in the next few weeks. © DrivingTheGospelHome and George Lockyer 2011-2012. Unauthorized use and/or duplication of this material without express and written permission from this blog’s author and/or owner is strictly prohibited. Excerpts and links may be used, provided that full and clear credit is given to DrivingTheGospelHome with appropriate and specific direction to the original content.